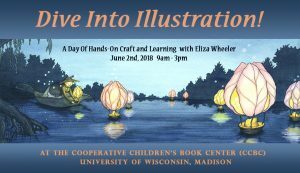 Dive into your style and craft with award-winning illustrator Eliza Wheeler in this one-day workshop at the cooperative children’s book center in Madison, WI. Illustrators—from beginner to experienced—make the common mistake of skipping crucial development phases of the creative process, and attempt jumping into the final illustration too soon. In this one-day workshop, we will dive into the PROCESS of creating inspired and elevated illustrations. We’ll dissect stages of the creative process, which include; gathering inspiration, using visual reference, studying the building blocks of images, experimenting with our own, and learning to refine and assess the work. Attendees will also be encouraged to explore their personal style. While a basic understanding of drawing fundamentals and color theory will be beneficial, the workshop can be applicable for illustrators of all levels. The day will be a mixture of presentation and discussion, with segments of independent sketching and brainstorming. This workshop is introvert-friendly – no group work or pairing off will be involved; all input and sharing is voluntary. Come ready to sketch, and to go home with new tools and ideas!